When you hear the word “trail” what comes to mind? Is it a winding dirt path under towering cedars, or a wide, paved path alongside a meandering river? 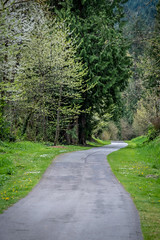 Chances are the former comes to mind, but Regional Trails, the wide paved paths, are all over King County. Covering over 300 miles in our county, regional trails give our communities access to both non-motorized commuting opportunities — over 3,000 people use the Burke-Gilman Trail every day during the summer — and active outdoor recreation space. So what makes a regional trail different from a backcountry trail? For one, they tend to be flatter, since many of them were built in old railroad corridors (check out this video about the Burke-Gilman Trail’s creation); they’re also wider – from 10 to 12 feet – to allow for higher volumes and the safe use by walkers, runners, cyclists, people with pets, babies and others; and they’re mostly paved for easy access for all ages and abilities. Know a trail that fits this description near you? Chances are it’s on our Regional Trails TrailFinder map as well. Looking for fun trails to visit and explore? You can pick up a hard copy of our Regional Trails in King County Map at any local King County, and most Seattle Public Libraries or plan your route on TrailFinder. Regional Trails are an amazing part of what makes living in King County an amazing experience. Right now, if you find yourself on one of our Regional Trails in King County, snap a picture and add it to your Instagram page for a chance to win a fun prize package. Check out PicturingTrails.com for all the details on how to win! If you’re not out on the trail, get out there and explore Your Big Backyard! Next Post Marymoor Park Concerts: I Love the 90’s. We took pics.